Ted and Dylan’s school asked me if it was ok for the local paper to take photo’s of Ted and Dylan with the basketball trophy, and also if it would be all right to give the paper a bit of background info concerning their Dyspraxia. I discussed it with Ted and Dylan and they said fine. The local paper rang me and asked a few questions too. I assumed it would be a small good news story, but in fact discovered today that it is the front page. Blimey. Anyway, as far as we are concerned the more awareness there is about Dyspraxia the better. The headline is rather sensational, but if another child with dyspraxia, or a parent of a dyspraxic child, reads about this and feels a bit more hopeful and optimistic it will be great. Ted was a little unsure about revealing his difficulties because he tries very hard to disguise them, but when he saw the piece this morning he was chuffed to bits. Dylan is still in shock at being headline news! A FEW years ago, dyspraxic Rustington twins Ted and Dylan Crowley could not even walk in a straight line. Now they are sporting champions. Basketball mad, the 11 year olds are members of Georgian Gardens Primary School’s boys team, which qualified for, and won, the Worthing Thunder schools’ competition on Saturday (18), at the British Basketball League club’s ground. 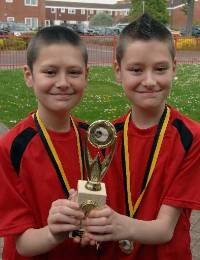 The school’s sport co-ordinator Sue Sunderland added that the pair had overcome all the odds, as they were told when they were five that they would never be able to take part in main-stream sporting classes or events. Dyspraxia is a condition which affects co-ordination and organisation of movement, and is estimated to affect up to ten per cent of the population, and about two per cent severely, like Ted and Dylan. It is something that will never go away, she said, but something they were learning to deal with. Sue though, disagreed and said it was all down to hard work and determination on their part. “When they first joined the school, I remember them trying out for the athletics team, and they couldn’t even get down the track in a straight line. Full article available from paper. This is completely awesome! WOO! Brilliant! You must be such a proud mama! That is so brilliant, I bet Ted and Dylan are really thrilled!